Designed for children five years of age and over, Disney's Activity Center: The Lion King features educational activities, mini-games and artistic capabilities wrapped around the world seen in the animated movie. Acting as the central hub, the Pride Lands incorporates three distinctive locations -- the Jungle, Rafiki's Tree and the Shadowlands, each featuring a series of activities. By entering the first environment, you have access to three games. The first, Timon's Bug Matching Game, involves matching two bugs of the same type from among a series of similar looking insects. After filling Timon's belly, move on to the educational Timon and Pumbaa's Spelling Game. Once you correctly spell the given word, Pumbaa falls into a pit of mud -- incentive to spell correctly. The final game is Pumbaa's Hidden Animal Friends with the objective to locate incognito animals in three different jungle-designed scenes. Rafiki's Tree includes three activities including Art Center, Picture Puzzles and an African board game known as Achi. Art Center demands an imagination -- you begin with a blank canvas and create whatever comes to mind using a piece of chalk, paint or the magic brush. If you're feeling uninspired, you can utilize the coloring book feature or connect the dots. Picture Puzzles incorporates scenes from The Lion King movie...only thing is, they've been broken into pieces. Your objective is to put them back together by clicking and dragging individual pieces to their respective places. Similar to tic-tac-toe, Achi features a series of colored stones and scooped out sections. The idea is to place three stones in a vertical, horizontal or diagonal fashion; unfortunately, your opponent is trying to do the exact same thing. Finally, the Shadowlands includes Ed's Xylobones, Memory Challenge and Simba's A-Maze-ing Escape. As the play on word suggests, Ed's Xylobones is a rhythmic jam session featuring different musical notes, drumbeats and tones. You have the option of creating your own song or participating in a duet. Memory Challenge features a series of cards (facing down) with corresponding characters from the animated film. Once you've selected a card, you must find the matching card; this continues until all cards have been removed. Finally, in Simba's A-Maze-ing Escape, you must guide Simba back into the jungle with a gang of rabid hyenas chasing you. If you'd rather not deal with these nuisances, there's a difficulty option that eliminates them. 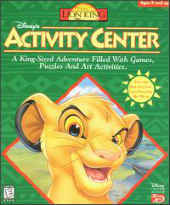 Disney's Activity Center: The Lion King also features a Magic Pool that allows you to view scenes from The Lion King. The game contains varying difficulty settings, recognizable icons, voice-overs and a cursor-driven interface.